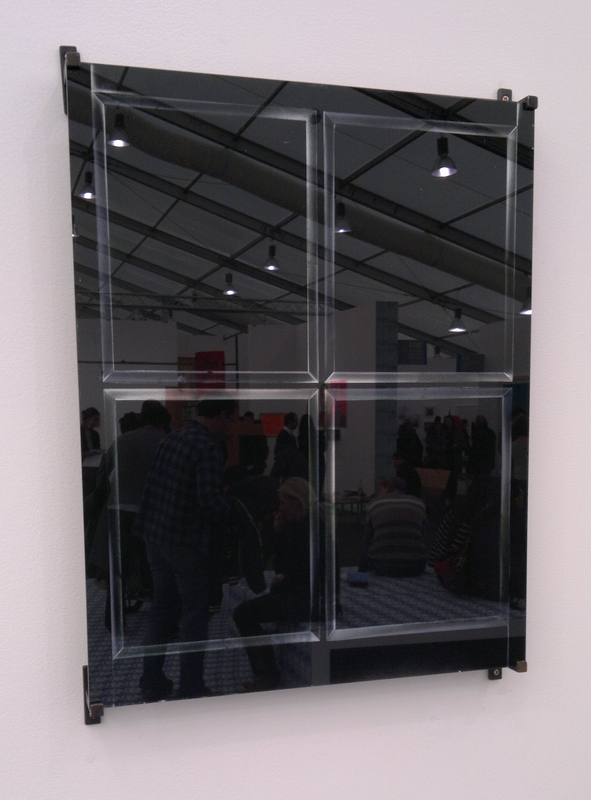 Simon Periton’s The Sorcerer (2011) on The Modern Institute stand turns a glass sheet into a window, which cannot be seen through, painted with black spray paint and highlighted with silver edgings, but which creates a strong reflection of the life inside the fair. This could be seen to be an introspective view, but I prefer the notion that Periton casts you as a viewer gazing upon the fair through a window, perhaps as something of an outsider or member of the public passing through Regent’s Park, not initiated with every contemporary art dealer on the planet. 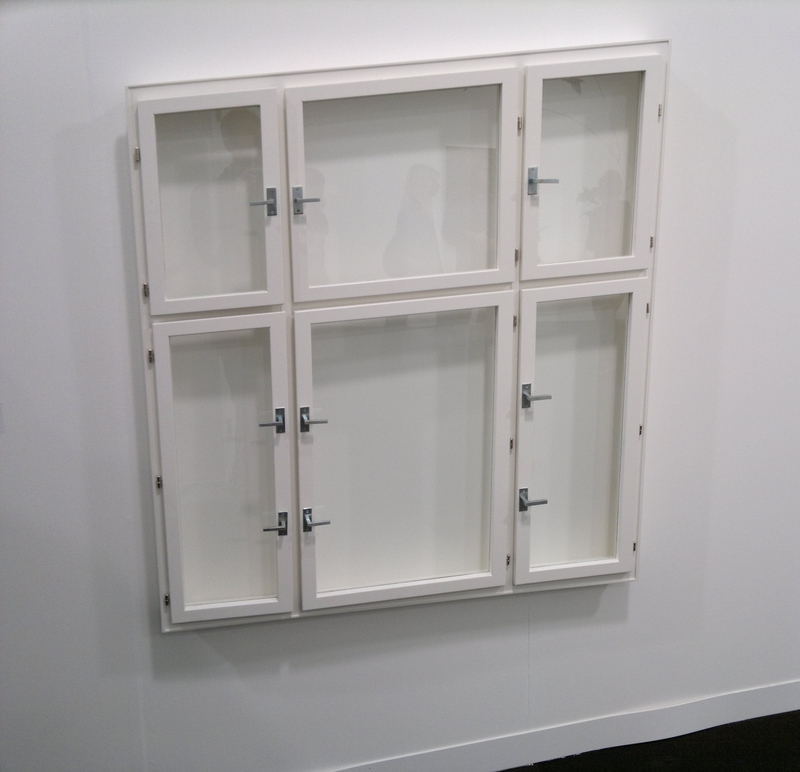 On a less optimistic note, Liam Gillick seems to have responded to recession by producing small wall works, Terminal Collapse (2012) on the Galerie Micheline Szwajcer stand and Restricted Collapse (2011) on the Maureen Paley stand, which could be seen to represent boarded or shuttered windows, prevaricating entry or viewing, or being closed for business. Meanwhile at nearby Sunday Art Fair at Ambica P3, Cynthia Daignault, shown by Lisa Cooley, has painted a reminiscent series of images of the panelled window and view of a tree outside her former residence, each painting depicting a different season. Installed in a row on the outside wall of the space though, these create a picturesque outlook in this subterranean basement space. 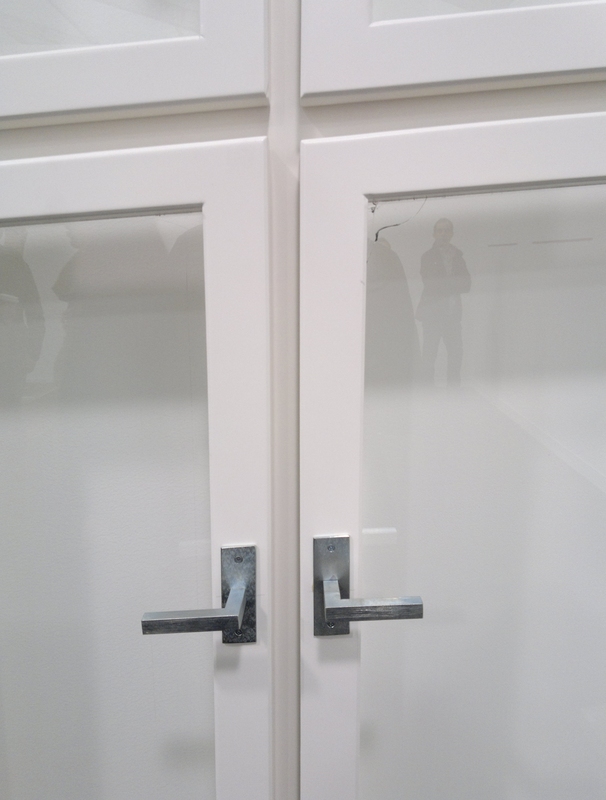 Back at Frieze London, Gavin Turk’s work appears on both the Almine Rech Gallery and Aurel Scheibler stands, both depicting partially open doors. 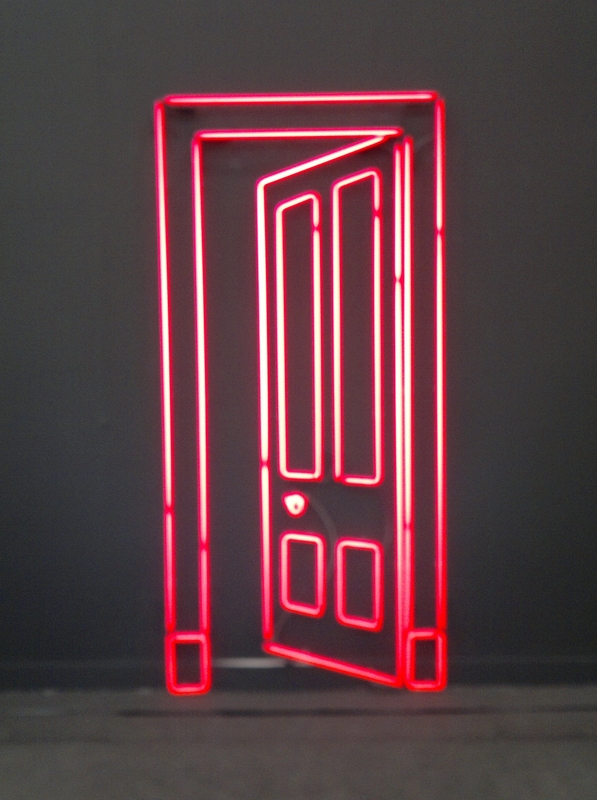 The first work is a flat neon light outline that appears to lead beyond the gallery wall like a trompe-l’oeil painting, however if you were to try to enter this space you would probably smash the work. 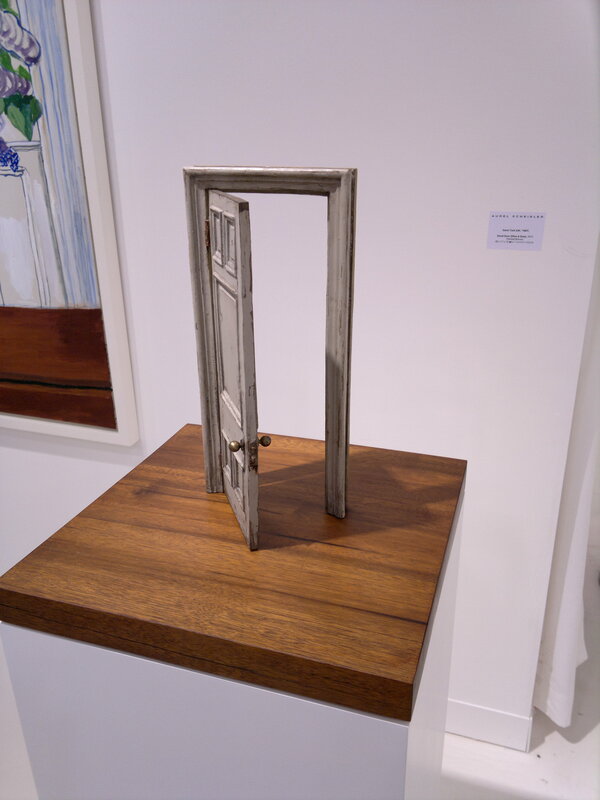 Meanwhile, Small Door (Olive & Grey) (2012) on the Scheibler stand is a miniature physical embodiment of a door, lodged permanently half open in a door frame. With evidence of wear to the paintwork and physical material of the door embodied in the work, together with the panelling of the door, this clearly represents an old and frequently passed through space, yet Turk has cast this transient space, or Non-Place as Marc Augé would refer with his book available from the Koenig Books stand in the fair, in bronze so that it is fixed partially open, allowing some but not all to enter. A life-size version of this work was installed at Snap 2012 in June at Aldeburgh Festival, Snape Maltings. 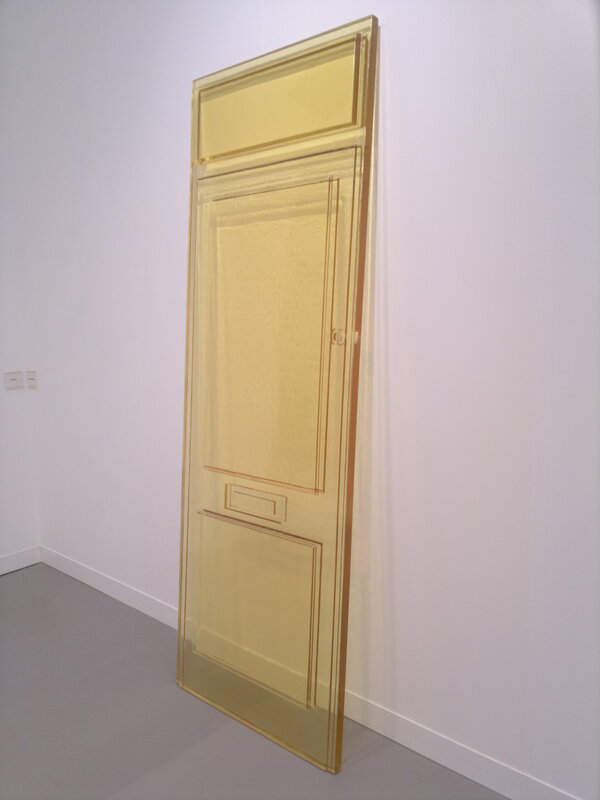 Finally, a door cast by Rachel Whiteread leans against the wall in the Galleria Lorcan O’Neill stand at Frieze, much like Joseph Kosuth’s Any 2m Square of Glass Leant Against Any Wall passed somewhere else in the fair. This is again solid and impassable, yet the fact it is leant against the wall perhaps suggests it has been forcibly removed from its frame and that where it previously stood can now be passed. It is also similarly transparent. Meanwhile Andreas Lolis’ Untitled series (2011-12) on The Breeder stand reminds of Whiteread’s Turbine Hall commission at Tate Modern, Embankment (2005), but where Whiteread cast the insides of cardboard boxes in plastic, Lolis has created the entire forms of a series of often distressed cardboard boxes from marble, plus one contains a marble scroll, contents unknown. This is the opposite action to Meekyoung Shin’s work, previously discussed in the articles A Return to Classicism and All That Glitters Isn’t Necessarily Gold. Where Shin made sculptures out of ephemeral soap, Lolis has transformed the ready to be disposed of, lightweight, protective cardboard packaging into something permanent, hard, heavy and not easily transported, in opposition to the objects’ function. Hence Lolis has created something like a tombstone or mausoleum to the objects as sacrificial forms, disposed of in their thousands like an act of genocide. Turk has also cast cardboard boxes (and rubbish bags) in Bronze, however his works Brillo (III) (2001) and Box (2002) are of new boxes, designed to be indistinguishable from the real thing, whereas Lolis’ works are more like death masks of boxes ready to be disposed of. 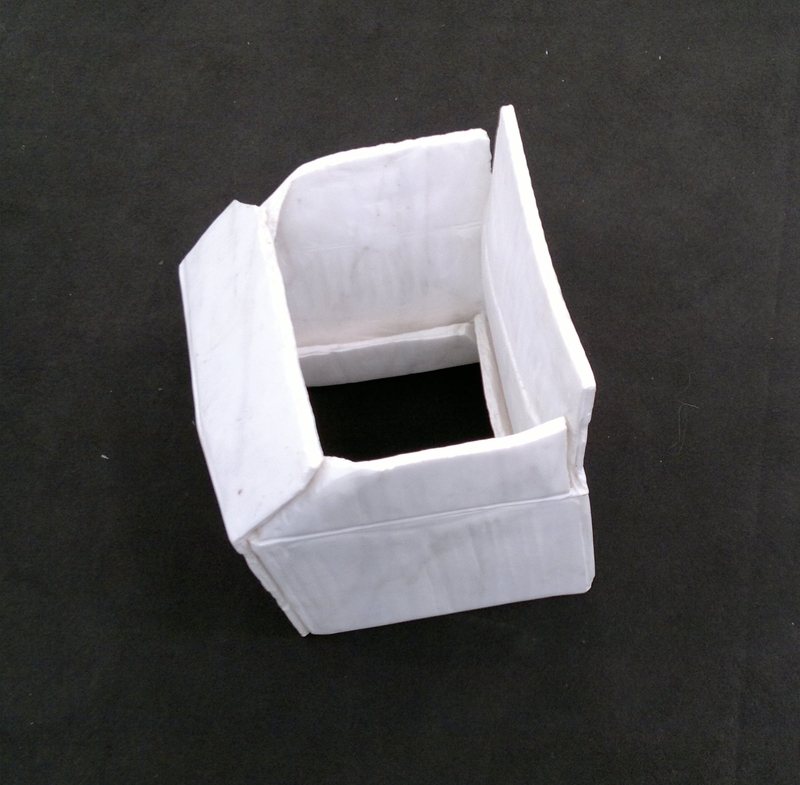 Due to the lack of graining in the material and the impressive amount of detail in the ridging of corrugation, torn edges and thin structure, with potential for disaster during construction, it feels as though Lolis’ works, like Whiteread’s and Turk’s work, must be cast, but in this case using marble powder and resin. 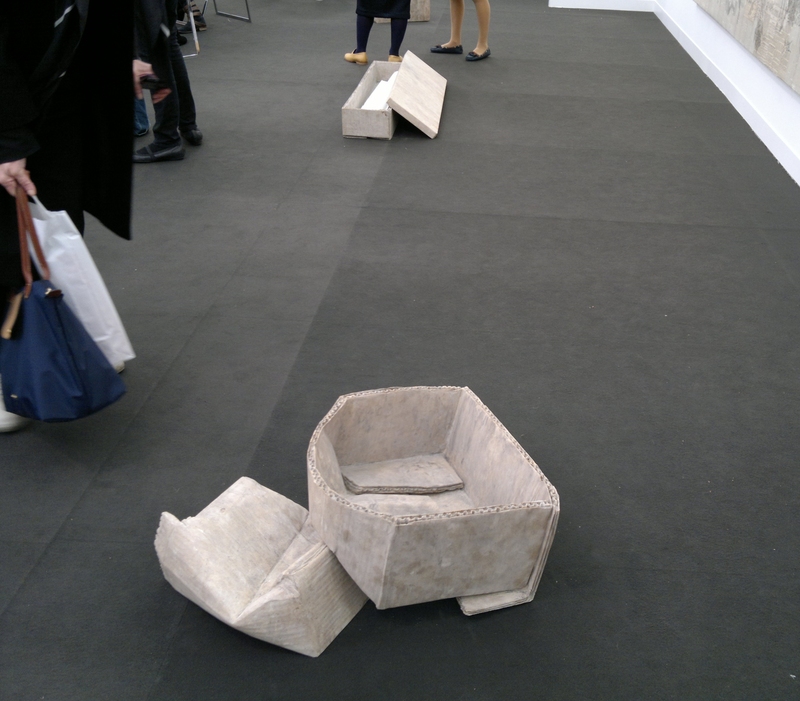 However I am informed that they are in fact carved from solid blocks of Moroccan and Dionysian marble. Whether you like it or not, the Frieze Art Fair provides a glimpse upon the art world, as I believe these works demonstrate observations to look beyond. 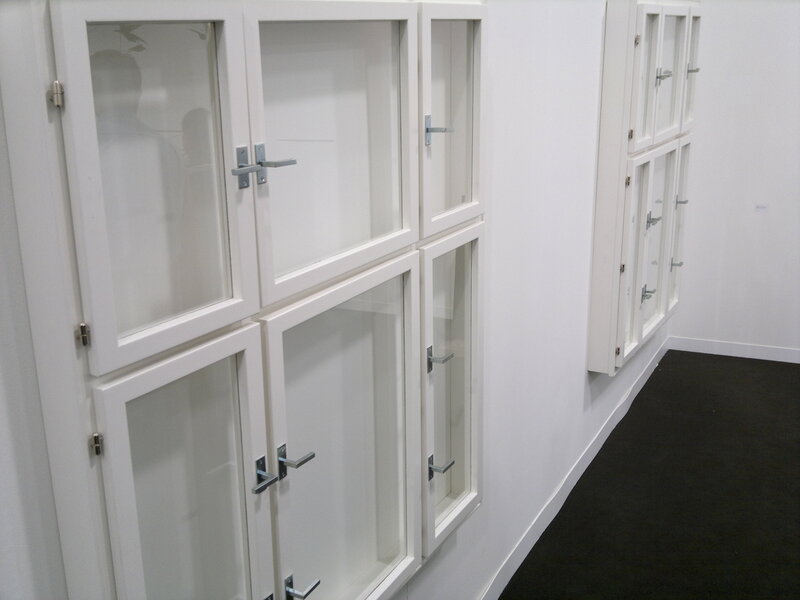 Frieze London is in Regent’s Park until 14th October 2012. Sunday is at Ambica P3, University of Westminster, 35 Marylebone Road, London NW1 5LS until 14th October 2012. 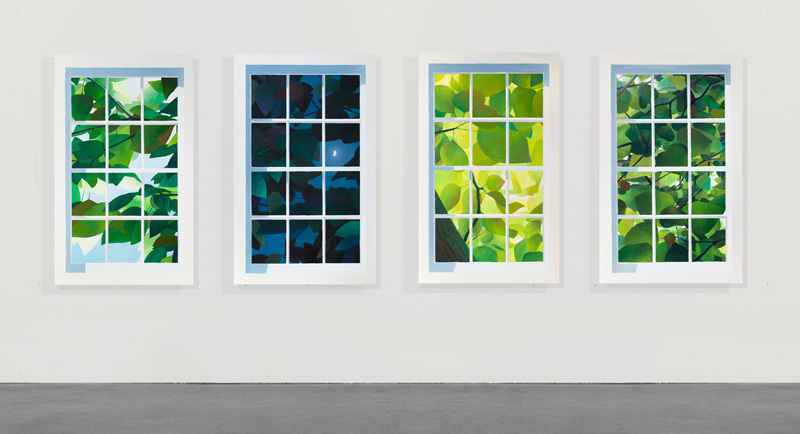 Liam Gillick has a solo exhibition at Maureen Paley, 21 Herald Street, London E2 6JT until 18th November 2012.